Book Two of the Iliad is the most politically revealing passage found in Homeric literature. Recall our heroes, the disparate Achaean princes feuding with one another. Despite being united under the arrogant leadership of Agamemnon, who is regularly deemed “the shepherd of the people,” the Achaeans are squabbling over property. The Achaeans have banded together to form a collective whole composed of many distinct parts to confront the strong walls of Ilium (Troy) in battle. Paris, son of Priam and brother of Hector, has wrongfully eloped with Helen, the wife of Menelaus, and this gross degradation of Menelaus’s honor causes a series of tribal treaties to be invoked, compelling the greater Achaean territories to war with Troy. Woman, in this case Helen, is the most dangerous creature, an object of immense beauty that impels terrible destruction. She makes inferior men like Paris a salve to their passions. However, in the ninth year of this war, Agamemnon and Achilles are confronted with reasons to return home before Menelaus’s wife is rightfully returned to him. The question of whether the woman is worth pursuing is raised. After receiving a deceitful Dream from Zeus, Agamemnon gathers his counsel of princes. He speaks first to the leaders, then to the masses, convincing them to return home from Ilium. Remarkably, throughout the proceedings, the Greek body politic is civil -the Greeks are listeners. Each man speaks in his own turn. Homer, as the teacher of the Greeks, presents a highly civilized model for a future culture. Mimesis requires politics as the crucial foundation from which to create. Recall the promise of friendship exchanged by Glaucos and Diomedes of Argos with one another in Book VI, or the exchange of gifts between mortal enemies Ajax and Hector in Book VII. As the title of the text reveals to us, the book is about the city. The birth of Greek identity. Broadly speaking, the Iliad acknowledges and reveals to us the concealed forces that govern our actions and reactions, as they are apportioned to the city. For example, Eris and Envy are ever present gods to the Greek mind. Conflict and pain are necessary forces that govern life. For the Greeks, the Iliad reveals to us our inner human pains and envies, as our churning will manifests itself in politics and war. Rather than denying and suppressing our inner drive toward arete, our will to power, the Homeric politeia acknowledges envy, spite, anger, and honor as elemental life-yielding truths. Each Greek leader believes himself to be the best of men, and a competition of excellence necessarily ensues. A timocratic politeia begins to develop -each caring not for his own individual self-preservation, but rather for his honor and respect. Each man believes he is owed due goods so that he may not lose his respect and honor. Agamemnon believes he is the best of men because he rules the largest number. Achilles believes he is the best of men because he is the mightiest warrior. Odysseus seeks no justification for his excellence. He is both wily and wise, so much so that he “knows” the voice of Athena when she speaks to him. Much like the serpent in Genesis, Odysseus is “cunning,” and a leader of men. When Thersites of the “endless speech” who was the “ugliest man” (Book II, 210-216) verbally abuses Agamemnon, Odysseus publicly threatens him and strikes Thersites, forcing a tear in his eye as the Achaeans laugh. We moderns must resist the urge to read this passage as tragicomic, lest we find ourselves in a dizzying Quixotic bind. To the classical audience, it is a merely comic scene. The Greek citizen laughs in the face of weakness, like that of Thersites. Hellenism shows no kindness toward the meek and mild. How foreign is this kind of laughter to the modern mind! However, the Homeric tale leads us not only into the Achaean camp, but also behind the walls of the Trojan city. Here, in Troy we encounter the aging Priam, the shining strength of Hector, and the weakness of Paris, sometimes called Alexandros. Hector is an equally admirable hero to any of those we find in the Achaean camp. He is determined to preserve his city’s honor, Hector leads the Trojan armies despite his younger brother’s impassioned disrespect for custom. After young Paris is swept away from battling with Menelaus over possession of Helen, Hector enters the mighty gates of Ilium and berates Paris. More than three times he addresses Paris as, “Strange man.” Paris is a stranger not only to nomos, but also to his own brother. His disrespect for law is foreign to the people of Ilium. The downfall of Troy is in the decision to protect this stranger, a native son, who follows the wayward whims of his heart over the political demands of the city. He poses a threat to the honor of the city, and is thus a potential weakness. A careful examination of where Homer’s temporal presentation leads is also helpful. During scenes of politics, the author recollects the moment. It is presented to the audience in the past tense. However, during scenes of battle, the author often uses the word “now” to indicate urgency or immediacy. Politics is better understood in reverse, knowledge comes when one engages in the activity of recollection -and knowledge of things political is the highest form of knowledge attained within the city. The chaotic motion of the battle makes it more difficult and dizzying to have knowledge the moment. In order to understand political things, men must climb higher than the ground-level to survey the scene. They must stand on high mountains, to see things a little more clearly. Men must also have space and order to recollect things past. Politics escapes none in the Iliad, not even the gods. Zeus is compelled to balance the wishes of Hera, Athena supports the Achaeans, Ares is easily angered by the battalions. The will of each god also comes into conflict with the humans in their war, and their politics. However, the frivolity of the gods binds the fate of the warriors. The humans fight each other to become “like the gods” and yet they surpass even the gods in their desire to be best. Not even the gods can stop the strong-willed Greeks. Their competing inner intentions are embroiled to overcome the status of being human, of the finality of life. The highest political thing to the Greeks, honor, transcends the value of self-preservation, and they fight to overcome death. The gods are envious of the humans and the terminal finitude to their lives. They live an existential life wherein the character and quality of death can cause angst. Our heroes ask themselves: How will I die? When will I die? For what purpose will I die? 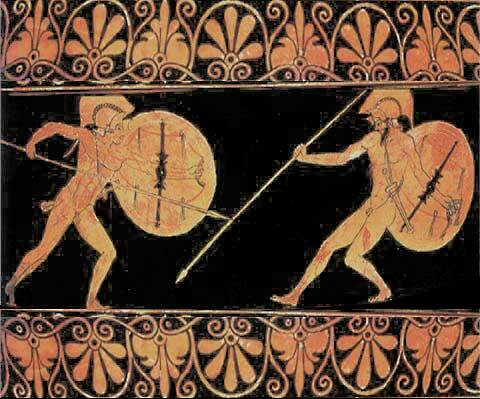 Achilles must decide between dying honorably in battle or returning home for a lengthy but forgotten life. Therefore, Homer exposes to us not merely the dynamics of the city, but also the underlying tensions that form the body politic. The Iliad reveals to us our nature. The inner competing wills that lie beneath the politeia. ← What Is Mosaic Law?